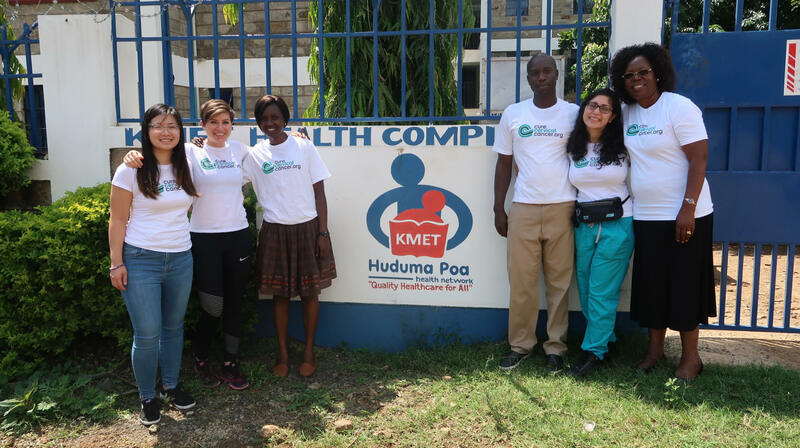 Monica Oguttu (Executive Director of KMET), Faith Nyantika (new CCC Community Health Nurse), and Oscar Okoth stand with the CCC team in front of the KMET Health Complex. 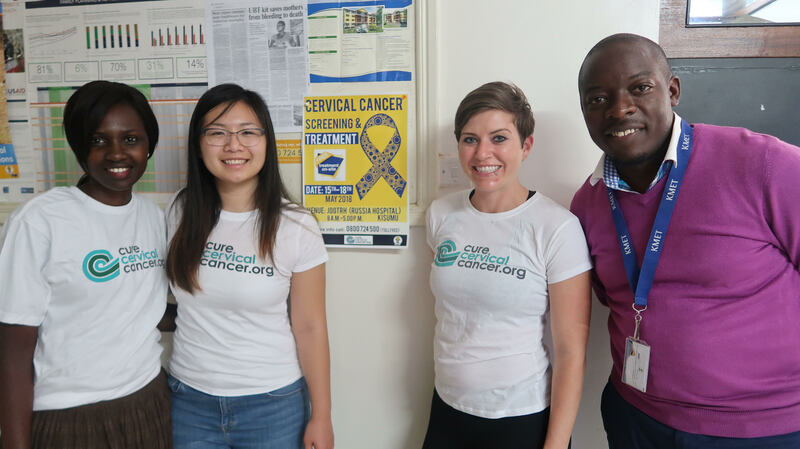 CureCervicalCancer is currently partnering with Kisumu Medical and Education Trust (KMET) for a week-long training program in Kisumu, Kenya. This partnership will result in the establishment of three new “See & Treat” clinics and the revitalization of four existing CCC “See & Treat” clinics. The KMET partnership exemplifies our ground partner model which promotes the sustainability of our program through the use of an established partner on the ground, who will oversee our clinics long after we’ve left the region. During this program, the CCC team will be joined by six Facilitators who will be overseeing the new trainees in small groups to learn essential “See & Treat” techniques: CO2 set up, cryotherapy, disinfection/sterilization, and clinic set up. CCC/KMET Team Monica, Faith, and Rebecca strategize for the training program. 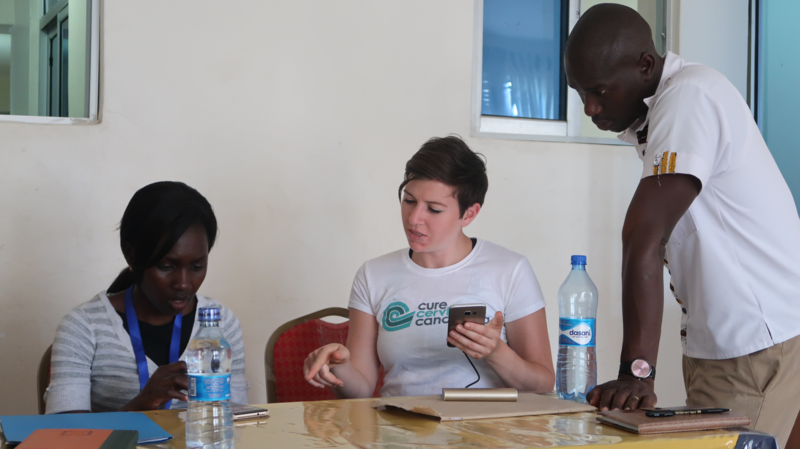 The CCC team arrived in Kisumu today to meet with the KMET team and Facilitators to debrief before the training. Monica, KMET Director, led the meeting with CCC Program Director Rebecca who discussed strategies for the training week. In the afternoon, the CCC team met with a few of the Facilitators to go over the training material and to assign roles of Facilitators during the training program. CCC Program Director Rebecca reviews training materials with Faith. An important step in the “See & Treat” program is to gather women in the community who may benefit from this screening. Faith, a member of the KMET team and the new CCC Community Health Nurse, will help train Community Health Volunteers who will perform outreach in the community to raise awareness of cervical cancer. The KMET team has already begun to mobilize women through a social media and poster campaign. KMET team Faith and Griffin stand with part of the CCC team in front of the poster designed by KMET advertising our upcoming training program. The KMET team has begun to mobilize women through graphics such as this poster advertising the CCC/KMET “See & Treat” program. This partnership between CCC and KMET promises to be very fruitful for the health and welfare of the women of Kisumu. We are hopeful that this collaboration will make a real impact in Kenya. 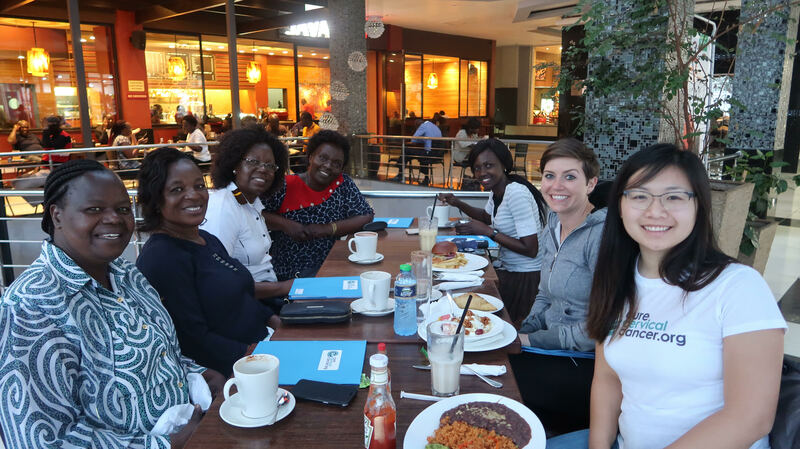 Facilitators Syprose, Mercy, Monica (Executive Director of KMET), and Monica (Chief Cancer Office, County Representative), Faith (CCC Nurse), and the CCC Team meet to discuss the itinerary and details for the upcoming training.